The new generation Ford Fiesta has finally touched down in the UK. 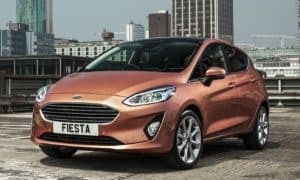 The first new Fiesta to reach UK roads was a chrome copper five-door model in the range-topping Titanium trim with premium B&O PLAY audio and eight-inch touch screen connectivity. Under its bonnet was the brilliant single-litre EcoBoost 98bhp engine and the car was transported to a Ford dealership in Birmingham – the city which buys more Fiestas than anywhere else in the UK. The Fiesta has been Britain’s best-selling car every year since 2008 with 120,000 units registered in the UK in the last 12 months, and the new model lays claim to being the most technologically advanced small car on sale. That’s due to its high-tech features that ensure a safe and smooth journey, such as automatic perpendicular parking, blind spot alert, auto high beam and pre-collision assist featuring pedestrian detection, which warns the driver of people in or near the road ahead. The well-known Zetec and Titanium trims will be available from launch, with the sporty ST-Line and luxurious Vignale models joining the range in early autumn, followed by an all-new Active crossover and hot ST in spring 2018.